Name badge…do you wear it on your right or left shoulder? Do you know the correct shoulder to wear your name badge? 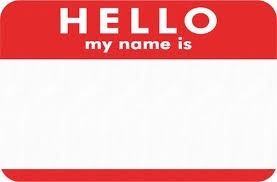 My husband Richard and I attended a Brandeis University gathering where guests were given name tags and a guest in our group asked us, Do you know which is the correct shoulder to wear your name tag? I piped up, “Yes…right shoulder” I’m not sure how I came to know for certain this tid bit of knowledge, but later that night I Googled it and found the reasoning…the theory is that the eye travels up the right arm when shaking hands and allows another to more easily read your name badge on your right shoulder.